Metro-Atlanta is rightfully known as the "City in the Trees"; however, many of our remnant native forest patches are ecologically impoverished, compromised with decades of under-managed vegetation. Though the science of forest restoration is well documented and offers cost effective management solutions, too many of our natural capital assets remain unclaimed. 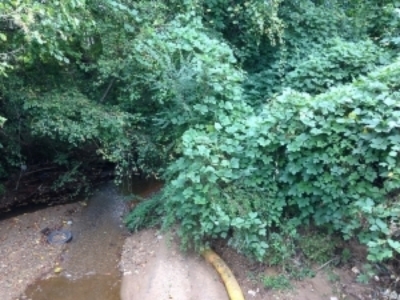 Forest under-stories have become havens for nonnative shrubs like Chinese privet and can often include well established stands of debilitating vines such as English ivy, Chinese Wisteria and Kudzu. With more than ten years experience, Cascade Springs Forestry partners with the stewardship community to recover our natural area treasures--thoughtfully, skillfully, and with long term commitment--restoring urban forests so they may contribute to the resurgent economy, nature-based recreation, and ecological health of both the local community and Atlanta region. CITY OF MCDONOUGH / BRON CLEVELAND ASSOCIATES, INC. Dense Chinese Wisteria and English Ivy dominated the under-story of what was then a recently acquired DeKalb County park space. With the help of Cascade Springs Forestry, the space is being revitalized into an inviting and engaging green space for both Nature and Nature lovers alike.